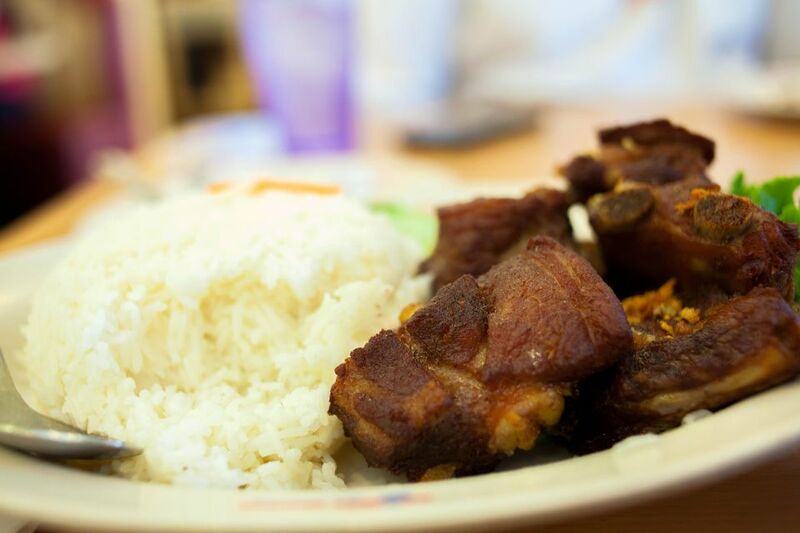 Although there may not be a big difference between American and Canadian Chinese food, there is one recipe that Montreal claims as their own: Chinese dry garlic spareribs. The ribs are first boiled in water and then simmered in a sauce made of brown sugar, garlic, soy sauce, and mustard. The result is a rib that is sticky and sweet—hand wipes are definitely needed! Bring a large pot of water to boil. Add the ribs to the boiling water; cover and allow to simmer for 30 minutes until tender. While the spareribs are simmering, mix together the brown sugar, water, garlic cloves, light soy sauce, and dry mustard in a small bowl. Remove the spareribs from the pot and slice the meat between the bones. (If you like, set aside the pork broth to use in another recipe.) Clean out the pot. Add the sauce ingredients to the pot and bring to a boil. Add the spareribs, bring back to a boil, and then lower the heat to a simmer for 10 to 15 minutes, basting often. Remove the ribs to a serving platter. Return the sauce to the heat and simmer to thicken; pour over the ribs and serve. Pork spareribs are the most popular type of rib so you should not have any difficulty finding them in the meat section of your supermarket. Spareribs are cut from the bottom section of the ribs (baby back are cut from the top section) and have flat bones with a lot of fat marbling throughout the meat. They are sold as slabs, with about 11 bones per slab and averaging 3 pounds per slab. Keep in mind, however, that half of this weight is the bone, so if it seems like you are buying more than you need, calculate the amount of meat per person, not the total weight of the rack of ribs. A good rule of thumb is that one slab of spareribs can feed two people. Also look for ribs with pinkish-red meat and no discoloration. Fresh spareribs will keep for 2 to 3 days in the refrigerator and up to six months in the freezer; it is best to use them soon after you buy them, however. If you freeze the ribs or buy frozen, plan for 12 to 14 hours in the fridge to thaw. No matter what, let the ribs come to room temperature for about 30 minutes before cooking. This recipe is very adaptable in terms of servings; you can easily increase the number of spareribs and then adjust the other ingredients accordingly.